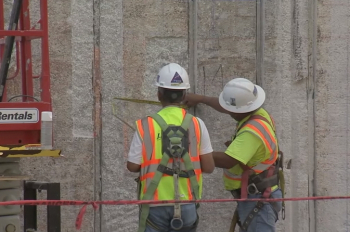 Kennedy Space Center’s famous launch pads are continuing their regeneration work in preparation for hosting their first orbital launches since the end of the Space Shuttle Program. 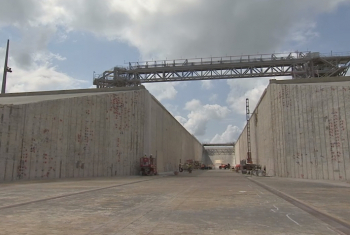 Pad 39B will host the most powerful of the new fleet of rockets, requiring a complete modernization of its Flame Trench – a process that includes replacing its famous brick wall. While most public attention has been on the changes taking place to Pad 39A – with the current space flight rock stars, SpaceX, in the final phase of converting the leased complex towards the debut of its Falcon Heavy rocket this year – next door’s Pad 39B has received the largest physical change of appearance. Converted into a “clean pad”, 39B is preparing to host the massive Space Launch System (SLS) rocket, which will be rolled up to the pad already mated to its Mobile Launcher (ML) that will replace the role of the since demolished Fixed Service Structure (FSS) from its Shuttle era. 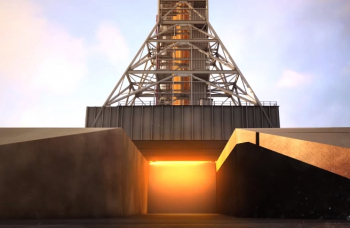 When SLS launches in late 2018, the rocket’s exhaust will be directed away from the pad via the Flame Trench, along foundations that have a history that ranges back to the Apollo Program. The first sign of the pads taking shape near the coastline saw earth movers build the pyramid base, prior to tons of concrete, bricks and support structures creating the flame trench. The flame trench – 571 feet long, 58 feet wide and 42 feet high – is built with concrete and refractory brick and bisects the pad at ground level. 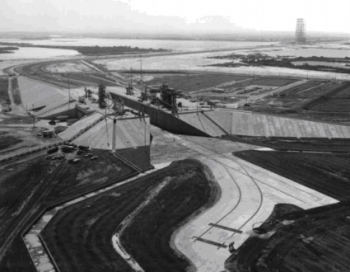 As KSC entered its new era with the Space Shuttle, a flame deflector system included an inverted, V-shaped steel structure covered with a high-temperature concrete material five inches thick that extended across the center of the flame trench. 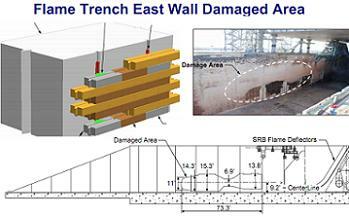 The 39B and 39A trenches performed well during their role with Shuttle, all the way through to STS-124, when Pad 39A’s trench wall suffered its most dramatic failure. The remaining bricks in the weakened area were removed, prior to repairs that included the spraying of Fondu Fyre – a Refractory Concrete – on to the surface of the flame trench. The trench performed without major incident during its remaining Shuttle launches. The repaired trench also means there are no concerns for SpaceX, although it will be launching Falcon Heavy and Falcon 9 rockets – which are all-liquid propellant based vehicles, as opposed to the mix of liquid and solid-fueled rocket engines used during Shuttle, with the “kick” of the solids at ignition a contributor to the STS-124 incident. With SLS providing more power at launch than Shuttle, with four RS-25s along with the Shuttle heritage of two solid rocket motors, evaluations into the requirements of 39B’s foundations called for several major improvements. The first, the installation of a new “universal flame deflector“, underwent design evaluations via NASA Ames’ supercomputer. 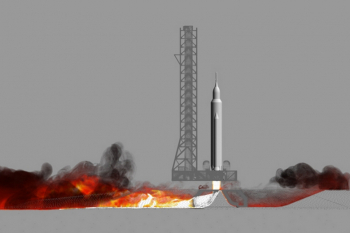 A deflector design – that could withstand the high heat from plume exhaust, that did not result in plume blow-back, and whose surface pressure was within design margin limits – was selected. This design is classed as similar to that used during the Apollo era. Another major requirement was the replacement of the bricks that line the Flame Trench. NASA awarded a contract to J. P. Donovan Construction of Rockledge, Florida, to construct the new flame deflector and refurbish the flame trench under the guidance of the Ground Systems Development and Operations (GSDO) Program office, along with Center Operations at the Kennedy Space Center (KSC). Ahead of the contractor starting work, KSC conducted a “pre-bid walk down” in late 2014, followed by the demolition of metal brick channels in the east flame trench wall for rebar assessment, per L2 KSC Status. Flame Trench wall surface work continued as a wall mock up preparations and installation opened this year’s efforts. The contractor then moved into preparing/saw cutting the Flame Trench flooring for demolition, while Flame Trench wall rebar and surface conditioning assessments continued. Workers removed old adhesive material and prepared the walls for brick installation on the north side of the trench. The installation work is expected to be complete by March of next year, with approximately 100,000 heat-resistant bricks, in three different sizes, secured to the walls using bonding mortar in combination with the adhesive anchors. This will allow the north side of the flame trench to withstand temperatures of up to 2000 degrees Fahrenheit at launch. “It’s very exciting to see this project making such great progress,” said Regina Spellman, GSDO launch pad senior project manager. According to L2 SLS status, that major milestone ahead of EM-1 will be in August 2018, with rollout of the Core Stage and Boosters to 39B for fit checks, modal testing and tanking/de-tanking tests. The stack will then be rolled back into Vehicle Assembly Building (HB-3), where the team will complete stacking with the Upper Stage and Orion, conduct additional modal testing and then move to the rollout of the full vehicle to the pad for a November 2018 launch.